In this lesson students work through a comprehensive set of notes before attempting a Tarsia card sort activity to consolidate knowledge acquired. 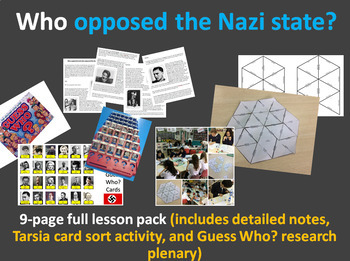 The lesson concludes with a game of Nazism 'Guess Who?' whereby students ask only questions which require a yes/no response (they can use the internet to help respond). Please note prior to purchase this game works best if you already have a board upon which you can stick the pictures! I hope your students find this lesson on German Widerstand and Resistance as useful as mine always do.